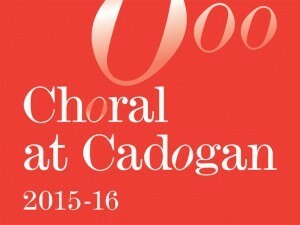 On Wednesday 15 July 2015, Cadogan Hall launched the 2015-2016 Choral at Cadogan series. Peter Phillips introduced the concerts and we were treated to performances both from Peter Phillips and The Tallis Scholars, and from the young ensemble Eo Nomine. Introducing Eo Nomine and describing them as up and coming, Peter Philips commented "I remember what it's like to be up and coming and it's hell". Eo Nomine (Camilla McMullan, Emilia Morton, Edward McMullan, James Way and Angus McPhee) gave us an impressive group of madrigals by Monteverdi, Gesualdi and Schutz singing with great sense of interaction and vivid characterisation, and some of the naughty bits in the Gesualdo were wonderful. The Tallis Scholars sang sacred and secular music by Byrd and Gibbons, a preview of music they will be performing at their concerts at Cadogan Hall and a rare chance to hear them in secular repertoire like Gibbons' The Silver Swan. The 2015-2016 series of Choral at Cadogan open on 22 October 2015, when Peter Phillips and The Tallis Scholars present a programme of sacred music in the vernacular. A programme entirely not in Latin, with music by Byrd, Gibbons, Schutz and Bach plus three works to celebrate John Rutter's 70th birthday. John Rutter crops up in the 11 December 2015 concert being given by Daniel Hyde and the choir of Magdalen College, Oxford. This is a chance to hear this fine mena nd boys choir in Christmas repertoire from Frescobaldi, Victoria and JCF Bach to RVW. In his introduction Peter Phillips mentioned the fact that Daniel Hyde has just played the entire works of JS Bach on the organ at Merton College, Oxford. On 11 February 2016, Nigel Short and Tenebrae bring a programme of French music ranging from Perotin and Brumel, through Durufle and de Severac, to Messiaen and finishing with Poulenc's rarely heard Figure Humaine, the amazing cry for liberty written during World War 2. On 17 March 2016. Alamire will be exploring music collected by Anne Boleyn in her song book which she assembled when at the French court. The Tallis Scholars' second concert in the series, on 20 April 2016, is called O Death, come close mine eyes. The music includes four different Lamentations by Tallis, Phinot, Nico Muhly and Matthew Martin. Martin's have been commissioned specially for the concert and Peter Phillips commented that they have not been written yet, 'though I am encouraging him on a fairly regular basis'. There will also be a chance to hear Arvo Part's 7 Magnificat Antiphons and his Magnificat. The wonderful Belgian ensemble Vox Luminis, director Lionel Meunier, return on 11 May 2016 with an all English programme with music by Tallis, White, Sheppard, Tomkins, Byrd, Ramsey, Weelkes and Morley. There are two more concerts of note, not in the series but of interest to lovers of choral music. On 16 December, Harry Christophers and The Sixteen present a Christmas themed programme with music by Tallis, John Tavener, Boris Ord, James McMillan, Gabriel Jackson and many more, then on 8 February 2016 they return with a programme based around Handel Dixit Dominus.